APRS is a real-time tactical digital communications protocol for exchanging information between a large number of stations covering a large (local) area. As a multi-user data network, it is quite different from conventional packet radio. APRS is different from regular packet in four ways. First by the integration of maps and other data displays to organize and display data, second, by using a one-to-many protocol to update everyone in real time, third, by using generic digipeating so that prior knowledge of the network is not required, AND FORTH, since 1997, a worldwide transparent internet backbone, linking everyone worldwide. APRS turns packet radio into a real-time tactical communications and display system for emergencies and public service applications (and global communications). Normal packet radio has only shown usefulness in passing bulk message traffic (Email) from point to point. It has been difficult to apply conventional packet to real time events where information has a very short life time and needs to get to everyone. Although the recent interfaces to the Internet make APRS a global communications system for live real-time traffic, this is not the primary objective. But like all of our other radios, how we use APRS in an emergency of special event is what drives the design of the APRS protocol. Although APRS is used 99% of the time over great distances, and benign conditions, the protocol is designed to be optimized for short distance real-time crisis operations. APRS provides universal connectivity to all stations by avoiding the complexity and limitations of a connected network. It permits any number of stations to exchange data just like voice users would on a voice net. Any station that has information to contribute simply sends it, and all stations receive it and log it. Secondly, APRS recognizes that one of the greatest real-time needs at any special event or emergency is the tracking of key assets. Where is the Event Leader? Where are the emergency vehicles? What's the Weather at various points in the County? To answer these questions, APRS is a full featured automatic vehicle location and status reporting system too. 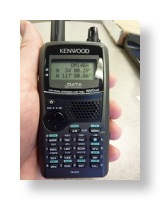 It can be used over any 2-way radio system including Amateur Radio (Ham), CB, Marine Band, and Cellular Phone. APRS is on 144.39 throughout the North American Continent. Other countries often use other frequencies. Check to see what frequency is used in your country for APRS. WEATHER STATION REPORTING: APRS position reports can also include the wind speed and direction, as well as other important weather conditions. Most APRS software programs support a serial interface option to the ULTIMETER and DAVIS and other home weather stations to do this automatically. All weather stations show up as a blue circle, with a line indicating wind speed and direction. Many APRS programs also have a database of the locations of most NWS sites and can crunch a file of NWS hourly WX conditions for display. 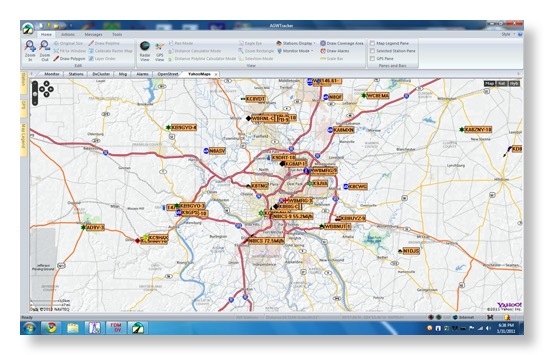 Finally, APRS users can set WX alarms and be alerted when WX conditions exceed those values. DX CLUSTERS: APRS an ideal tool for the DX cluster user. Not only does a user get to see all DX spots on the map, but by operating in the monitor only mode, a user has reduced the overall packet load on the DX cluster. This is a benefit to everyone on the channel. Also the APRS monitoring station will see the SPOT as soon as the first station gets it, rather than later on down the list. INTERNET: Most all APRS software programs can access the worldwide APRServe system and allow a user to display VHF and HF stations on a map from anywhere in the world allowing you to see who is on the air. Using the normal 144.39 channel, you can send and receive message traffic to ANYONE on APRS anywhere in the world. FREQUENCY COORDINATION: Every packet asset on every frequency should include a position or at least gridsquare in all routine BEACONS. This alows APRS to be used to monitor network topography on any frequency. Thus, APRS makes an excellent tool for frequency coordination. PROTOCOL - Although APRS redundantly transmits data, a fundamental precept is that old data is less important than new data. All APRS packets are repeated at an ever decreasing rate. Each new packet is transmitted immediately, then 20 seconds later. After every transmission, the period is doubled. After 20 minutes only six packets have been transmitted. From then on the rate remains at 10 minutes times the number of digipeater hops you are using. This allows the rate to be every 10 minutes for a local event or every 30 minutes for the typical home station running WIDE3-3. What is Required for APRS? as soon as the GPS is locked on the signals from the satellites, it will start beaconing your position. You will have to do a bit of configuration on the Tiny Trak using a Windows computer. Really easy but if you need help, there is a very active Tiny Trak group on Yahoo Groups. In more recent years there has been some all-in-one radio manufactured. Byonics sells a preconfigured APRS transmitter, Tiny Trak and GPS all in one box! This combination is very affordable. In addition there has been some all-in-one APRS handhelds manufactured from Yaesu and Kenwood however these units are a bit more expensive. But if you want a handheld that you can use on VHF and UHF repeaters, plus have the APRS option all built-in (including the GPS! ), then this is a strong direction for you to consider. 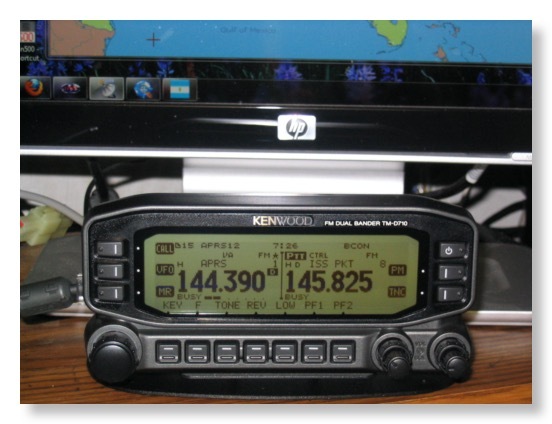 I have been looking at purchasing a Kenwood D710 VHF/UHF Dual-band transceiver for sometime. The D710 has a built-in TNC and the firmware to handle APRS right out of the box. For mobile users, all that is needed is a GPS receiver and you have a radio in your vehicle that allows for constant APRS use and voice at the same time. But the purpose of this article is to describe how I use the D710 in the shack for APRS on 144.39 and digipeating through the ISS on 145.825 at the same time. First, for those not familiar with the term "digipeating", it simply means having a digital packet repeated through a digital repeater. So just like "repeaters" repeat a voice signal, a digipeater simply repeats a digital packet. So NASA has allowed a digipeater to be installed on the ISS. This is simply a VHF radio with a TNC attached. So unlike a voice repeater which typically is receiving a voice signal on one frequency and simultaneously repeating the voice signal on another frequency, a digipeater receives the packet on the same frequency as it repeats it on. When a station send a packet of information, the digipeater receives it, then waits for the frequency to become clear and it then retransmits it or "repeats" in on the very same frequency where it received it. Pretty simplistic set-up. I have been into APRS for a number of years now. I usually had a radio on the standard APRS frequency of 144.39 24 hours a day. Several months ago, when Icom introduced the ID-31 UHF DStar handheld radio, I decided to put a UHF DStar hotspot on the air at my house. As a result, my dual band radio that I was using for APRS, was taken off of APRS and put into service as a DStar hotspot. This resulted in my being off of APRS at home for a few months now. I purchased my Kenwood D710 at the Dayton Hamvention in 2012 because if you want to buy radios at a great price, you wait until Dayton to buy them. As soon as I got home from the weekend Hamvention activities, I put the D710 back on the air with APRS using the D710's internal TNC. Very easy to set-up. In the past I used to digipeat APRS packets through the ISS. To do this, I usually changed the APRS radio's frequency from the standard 144.39 APRS, to the 145.825 frequency used by the ISS or International Space Station. Since the ISS is moving so fast, it is only in range for about 20 minutes more or less with each orbital pass. So when I finished with that pass, I would then change the radio back to 144.39 and the normal APRS frequency. That works fine actually, but I wanted to be able to keep a radio on the ISS frequency 24 hours a day and that is what the D710 allows me to do. While the D710 has an internal TNC to be used on "one side" of the radio, there is no built-in TNC to be used on the "other side" of the radio. You see the D710 is capable of receiving on two frequencies, or channels, at the same time. You can have the radio set-up as VHF/UHF, or VHF/VHF, or UHF/UHF. In this case, since both the standard APRS and ISS frequencies are both on the 2 meter VHF band, I have the VFOs or memories both set to VHF or as we say, a VHF/VHF configuration. The following picture of the actual operating display of the D710 demonstrates exactly how the radio is configured. On the PC side of things, I am using AGWPE which can be used as a sound card packet program, or as an interface to a TNC is KISS mode. The reason I use AGWPE to connect to a TNC (as an alternate, you can connect most TNCs to a serial port directly with the excepting of a KISS only TNC which in this case I am using) is not just because it is a KISS only TNC, but because it will allow multiple programs to access a single TNC at the same time. Also, UISS has to use AGWPE becuae that is the way the author wrote it. UISS is a program specifically designed to digipeat via the ISS or any other packet satellite. It works so well you can actually set it up to work automatically. I don't have to watch the tracking program any longer to see when the ISS or another packet satellite is in view. I can tell UISS what to listen for and it will start transmitting when it hears the "string" I have told it to listen for, and when it stops hearing that string, it will stop transmitting. In this case I have told it to listen for "RS0ISS-4" which is how the ISS digipeater is identifying. When it hears that call, it starts to transmit my location, my greeting, and will send out a packet acknowledging other stations that it hears. Very cool. You can find UISS at http://users.belgacom.net/hamradio/uiss.htm and it is mostly free. There are three levels of license. One, is that you download it, install it, and it works with most features. If you register it (free) the author will send you a code to turn on a few more features. Next if you make a donation to him or AMSAT - any amount - he will send you another code to turn on all features. The automatic QSO feature that I described above requires a donation. $10 to AMSAT as a donation will get you the code - or donate more if you wish. UISS is a great program and can also be used as a regular packet program if you wish. There are other modules that can be added onto UISS like mapping so you can see where the others stations are who are digitpeating through the ISS like you. There is also a SatGate module that feeds what you are receiving to the Internet, and a satellite tracking module. So there you have it. You don't need a D710 to use the ISS digi, but for me it makes it easy. Any two meter radio with a TNC, AGWPE and UISS along with a regular 2 meter antenna will allow you to access the ISS and any other APRS type packet satellites. Now go out, give it a try and have fun.